Educate, Elect, and Empower American Muslims in Florida; Stimulate a participating interest in public affairs that will foster better and more representative government for all Americans;Promote principles of the Democratic party at all levels; Encourage qualified American Muslim Democrats to become candidates for public office; Support applicable Democratic candidates and increase the number of registered and active American Muslim Democratic voters in Florida; Advocate for legislation and government action on a national, state, county and local level which reflects the best interest of the all Americans. 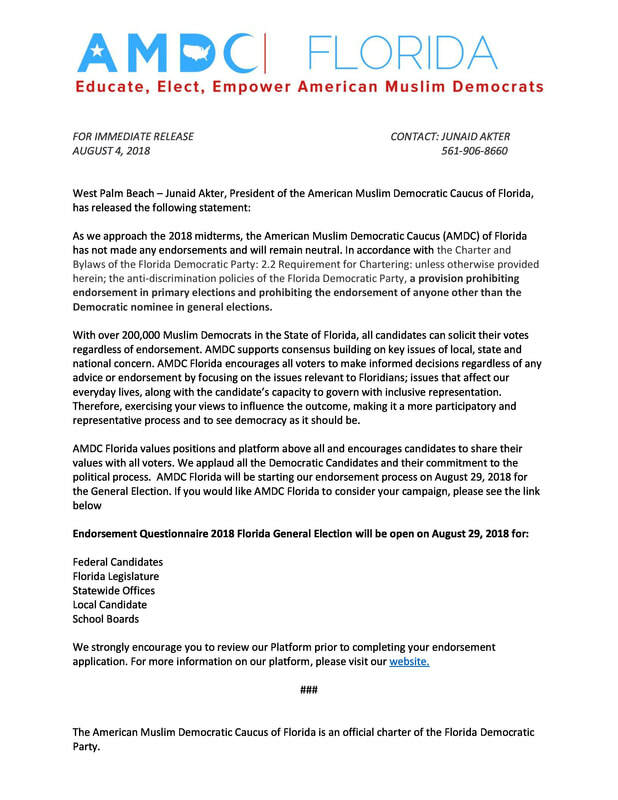 The American Muslim Democratic Caucus (AMDC FL) of Florida is a statewide caucus established in 2014 to unite and provide representation for Muslim Democrats within the Florida Democratic Party. The Caucus promotes the welfare of American Muslims through issue organizing, effective legislation, electoral organizing, organization-building and education, and by inspiring the uniquely diverse Florida Muslim Democrats to fully participate at all levels of public service and policy making. AMDC FL is an affiliate of the Muslim Caucus of America (www.themuslimcaucus.org).